Sciency Thoughts: Passers by forced to undergo decontamination after chemical spill in Motueka, South Island, New Zealand. Passers by forced to undergo decontamination after chemical spill in Motueka, South Island, New Zealand. Nine people, including a 10-month-old baby were forced to undergo decontamination after coming into contact with a chemical leaking from a truck in Motueka, South Island, New Zealand, on Wednesday 18 August 2016. The incident happened at about 11.00 am local time, when a liquid was observed leaking from the truck. An area of road 250 m on either side of the vehicle was closed while the spill was contained, with buildings close to the incident evacuated and people in those further away asked to remain indoors with their windows shut. The fluid was identified as hydrogen cyanamide, which is used in agriculture as a growth stimulant. 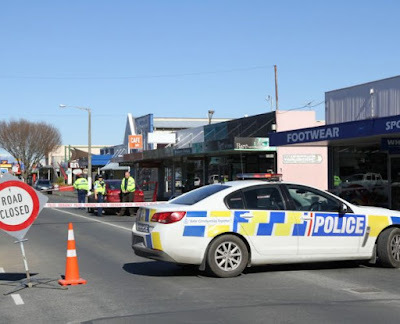 Road closed due to a chemical spill in Motueka, New Zealand, on Wednesday 18 August 2016. Safia Archer/Motueka Golden Bay Guardian. Hydrogen Cyanamide is widely used in New Zealand to provoke early spring growth in Kiwi Fruit, Actinidia spp.. It is known to cause a number of ill effects in exposed humans, including nausea, vomiting, headaches, dermatitis and reddening of the skin. Chemical spill at Scottish school puts two staff members in hospital. Three people hospitalized following titanium tetrachloride leak in Quebec. Asteroid 2016 QA2 passes the Earth. Identifying the clothes of Ötzi the Iceman. Landslide at Hindu Shrine kills at least one. Italian Earthquake kills at least 120 people. Second miner injured at Saskatchewan potash mine. Alabama river hit by sulphuric acid spill. Could there have been life on ancient Venus? Liquid-filled canyons detected on Titan. Asteroid 2016 CL264 passes the Earth. Miner injured in accident at Saskatchewan mine. Magnitude 5.1 Earthquake off the Peruvian Coast. Asteroid 2016 NG33 passes the Earth. Ninety-one confirmed deaths in Bihar flooding. Sewage spill closes beaches at Honolulu. Landslide kills four in Jammu in Kashmir.